It seems that a lot of people are 'over' Black-Eyed Susans. True, they are everywhere, in every public garden, in the flower beds of every company's parking lot, and I know a lot of people who are tired of them, but I still love them dearly! Native to North American, you have to love the simple, cheerful blooms on this tough and trouble-free perennial. I really like to use as many North American natives as I can, not so much out of any moral principal as much as I just like to honor the naturally-occurring beauty of native plants. 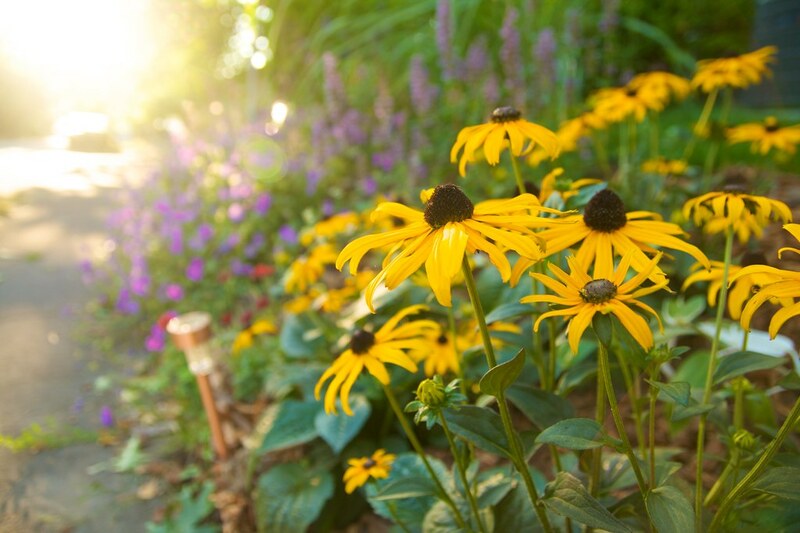 That being said, I have no compunctions about growing an exotic species, as long as it can survive in our climate :-) Anyway, Black-Eyed Susans, as an almost literal representation of the sun, really embody "summer" to me, and they arrive at a time when my garden is transitioning into warmer colors. The pinks and blues are still around, but are now augmented by the fiery tones of the Crocosmia, Helenium, Black-Eyed Susan and Knautia. As a side not, it seems like a lot of bloggers are already waxing poetic about summers passing and the onset of autumn. Isn't that jumping the gun a little, everyone? It seems that August and September are typically our warmest months (to be fair, summer doesn't really start for us until the first part of July here in Portland). Cheers everyone! In every Black-Eyed Susan is the potential for creatively taking it where no one has ever gone before. That is the challenge. I agree, my favorite time of year in my New Hampshire garden is just beginning now. All the weeding is done. It is getting cooler and less watering required and the annuals and fall players are about to peak. Bring it on! Some things are common for good reasons. Love the name of your post today! So fitting for your lovely shot. I am not over them...quite the contrary. My garden would be almost colorless without the zillions I have in bloom right now! Hi, Scott! Thanks for popping over for a visit at Peace in the Valley today! I think I've found the post you referred to in your comment. (Of course, I had to look for it.) I have wonderful youthful memories of black-eyed Susans. They grow up in the mountains of North Carolina, and I would walk the paths and cut fresh blooms during our summer vacations and put them in vases around the cabin. I certainly would never think of them as common. So cheery and sunshiny, as you point out.